The Yup’ik and Inupiat of Alaska as well as some Athabascan people call these fish “shees” and thus in Alaska the common name is sheefish. However, in other parts of the circumpolar north, this species is commonly called Inconnu (unknown fish) because early explorers, upon seeing this fish for the first time, did not know what they were. The Sheefish (inconnu) is the largest member of the whitefish subfamily (family Salmonidae; subfamily Coregoninae). Sheefish are white or silvery in color without spots or other markings and have very large scales. The lower jaw extends beyond the upper jaw and the mouth is full of small densely-packed teeth. They can grow to a large size. 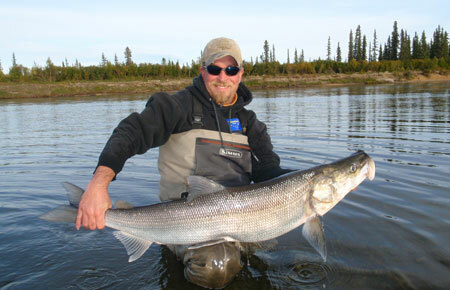 In the Selawik-Kobuk area of Alaska, sheefish may weigh up to 27 kilograms (~60 lbs) and be over 1 meter (~42 inches) in length. In other areas of Alaska, particularly in interior rivers, they tend to be much smaller. We believe that young sheefish hatch sometime in early spring before the winter ice breaks up. Rapidly flowing spring-melt water carries juvenile sheefish downstream. The young fish end up in backwater eddies along the river, off-channel lakes, and estuary regions at river mouths. All of these areas are good places to find food and hide from predators. Sheefish grow rapidly. On the Kuskokwim River, sheefish may reach 406 millimeters (16 inches) in length by age 2 and 762 millimeters (30 inches) in length by age 8. Juvenile fish feed mainly on insects and other small prey. As they mature, sheefish will feed almost exclusively on other fish. The age when sheefish start spawning depends on their location. 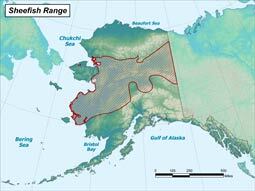 Sheefish in the Mackenzie River in Canada may reach sexual maturity at age 6. In Alaska streams, males mature at about 6-9 years. Females mature between 7-12 years. Sheefish captured under the ice near Kotzebue during the winter and spring months have stomachs full of herring. After spring ice breaks up, sheefish spend time in estuaries of the Yukon and Kuskokwim Rivers feeding heavily on oil-rich smelt. Many of these sheefish will then migrate upriver to the mouths of major tributaries and gorge on outmigrating juvenile fish species. How and where a sheefish spends its summer feeding can vary between different populations, within a population, and even in an individual fish. Kuskokwim River drainage sheefish often travel to the same spring/summer feeding areas from year to year whereas others will go to one tributary mouth one summer and a different one the following summer or visit multiple ones over the course of the summer. Sheefish may take up to two months to travel to a spawning area. Sheefish usually return to the same area where they themselves hatched. Similar to other whitefish species, sheefish are “broadcast spawners.” That is, they release eggs and milt into the water column. They do not dig nests. The fertilized eggs drift downstream and sink, becoming lodged in the gravel. Sheefish spawn from late September to early October. Sheefish prefer to spawn in shallow water with temperatures that range from about 0.5° C (33° F) to 5.5° C (42 F). Within a week or two after spawning, sheefish typically leave the area. Most sheefish spawn only every two or more years. However, some do travel to spawning areas in subsequent years. Due to the high energy requirement of producing between 100,000 to 400,000 eggs, females will usually skip a spawning season. Sheefish migrate over long-distances; some over 1,600 kilometers (~1,000 miles) within a single summer. Sheefish in major Alaskan river drainages such as the Kuskokwim, Yukon, Selawik, and Kobuk rivers typically overwinter in the brackish waters of the bays. During spring break up, many sheefish travel upriver to feed. Some will migrate upriver later in the summer to spawn. Some sheefish, called “residents” do not migrate to the bays at all. Instead, they remain in freshwater their entire lives. Sheefish live in large northern rivers and associated lakes of northwestern North America and in drainages of northern Asia to the White Sea. An isolated population occurs in the northern Caspian Sea and its inflowing rivers. They are often found in glacial, silt-laden rivers. Spawning areas can be in clear tributaries as well as those that run silty. Sheefish prefer to spawn over gravel of varying size. This helps insure that the eggs lodge on the bottom and are not carried away by the river current. Juvenile sheefish eat insects. Adults feed almost exclusively on other fish. Adult sheefish and other fish species eat juvenile sheefish. Broadcast spawners; can spawn multiple times during their lifespan. Can be amazing, long-distance travelers.